Old Man Gloom a.k.a. Zozobra burning at Fiestas de Santa Fe, September 8, 2005. Photo by Jeff Weiss. 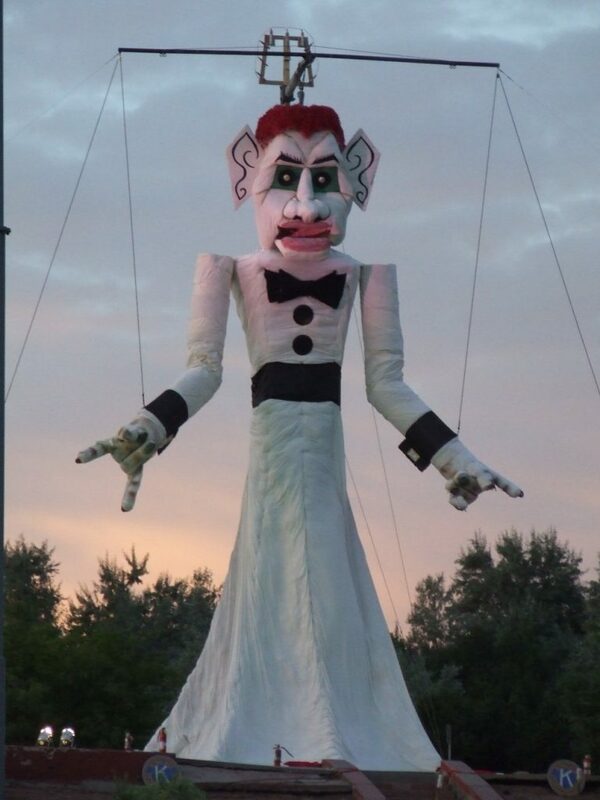 Zozobra (“Old Man Gloom”) is a 50 feet high giant marionette effigy that is built and burned during the annual Fiestas de Santa Fe in Santa Fe, New Mexico and marks the Fiestas’ start. As his name suggests, he embodies gloom; by burning him, people destroy the worries and troubles of the previous year in the flames. Anyone with an excess of gloom is encouraged to write down the nature of his or her gloom on a slip of paper and leave it in the “gloom box” found in the offices of the Santa Fe Reporter in the weeks leading up to the burn. Participants can also add documents on the day of the burning, prior to the event, by visiting a “gloom tent” where they can add to the marionette’s stuffing. Many people put legal papers in the gloom box as well. At the festival the papers from the gloom box are placed at Zozobra’s feet to be burned alongside him. Fiestas de Santa Fe has been held since 1712 to celebrate the Spanish retaking of the city in 1692 by Don Diego de Vargas from the Pueblo tribes who had occupied the city since the Pueblo Revolt of 1680. The burning of Zozobra dates from 1924. 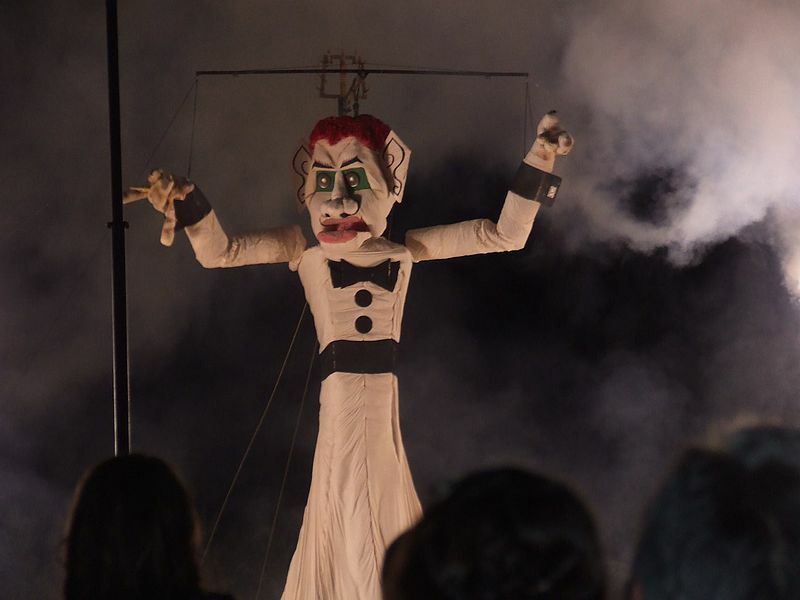 Santa Fe artist and marionette maker Gustave Baumann came up with the idea of creating the effigy, also called Old Man Gloom, and the ritual burning; and then conspired with his friend William Howard Shuster, Jr. to burn the first Zozobra [perhaps we should call him “El Zozobro“…?]. 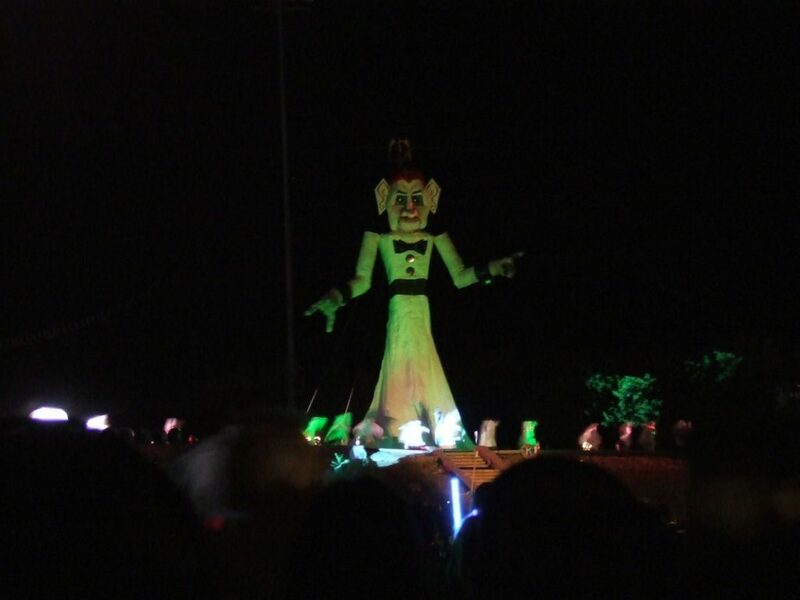 “Zozobra” means “anxiety” in Spanish. Baumann’s idea might have been influenced by Mexican cartonería (papier-mâché sculpture), especially the effigies exploded during the burning of Judas that takes place on Holy Saturday or New Year’s Eve, as a way of ridding oneself or one’s community of evil. Each year in Santa Fe New Mexico, more than 50,000 people go to watch Zozobra, who stands 50 feet tall.His burning marks the start of three days of celebration that includes traditional mass at St. Francis Cathedral; a reenactment of the Entrada, when Don Diego de Vargas returned to the city; a Children’s Pet Parade; and the Historical/Hysterical Parade. The Kiwanis Club of Santa Fe builds Zozobra and burns the effigy at Fort Marcy Park. The Zozobra that was burned on September 7, 2007, was certified by Guinness World Records as the largest marionette in the world, measuring 15.21 m (49.11 ft) in height. 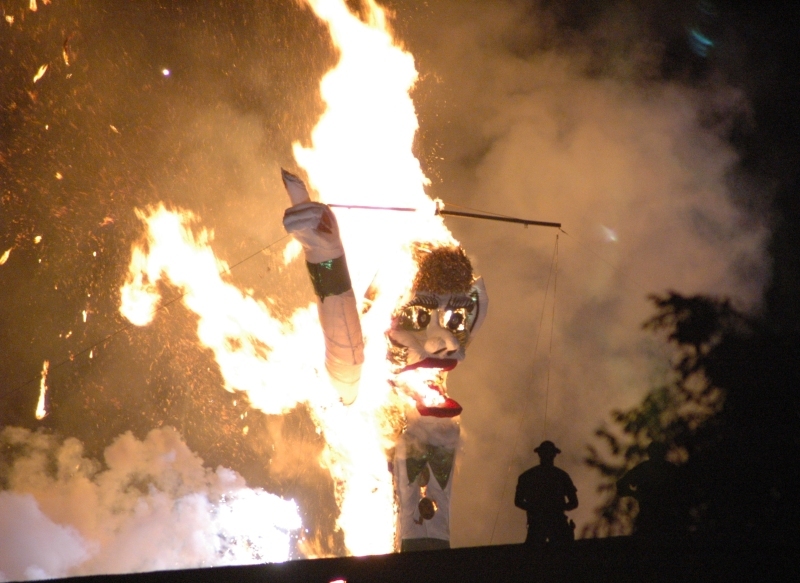 The Zozobra burning in Fort Marcy Park in Santa Fe, New Mexico has traditionally been held in September; however, ticket sales in advance of the event improved when it was moved to the Friday immediately before Labor Day in 2014. Once nightfall arrives fire dancers come out to perform. A “fire spirit dancer” also comes out dressed entirely in red with a flowing headdress and carrying two flaming torches, symbolizing Old Man Gloom’s arch enemy. She is accompanied by the small “glooms,” which are children dressed in white dancing alongside her. The fire dancer’s role is to scare away her little companions, as she represents the light that sends away the gloom and bad energy of the year. As the dancers perform on stage, Zozobra’s arms and head begin to move while letting out groans. After the dance is completed, the marionette is set on fire via attached fireworks. Once the marionette collapses, more fireworks are set off.